Pharmacodynamics. 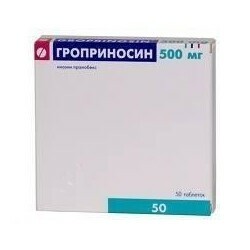 Alprostadil, the active ingredient of the drug Vasostenone, is a vasodilator. 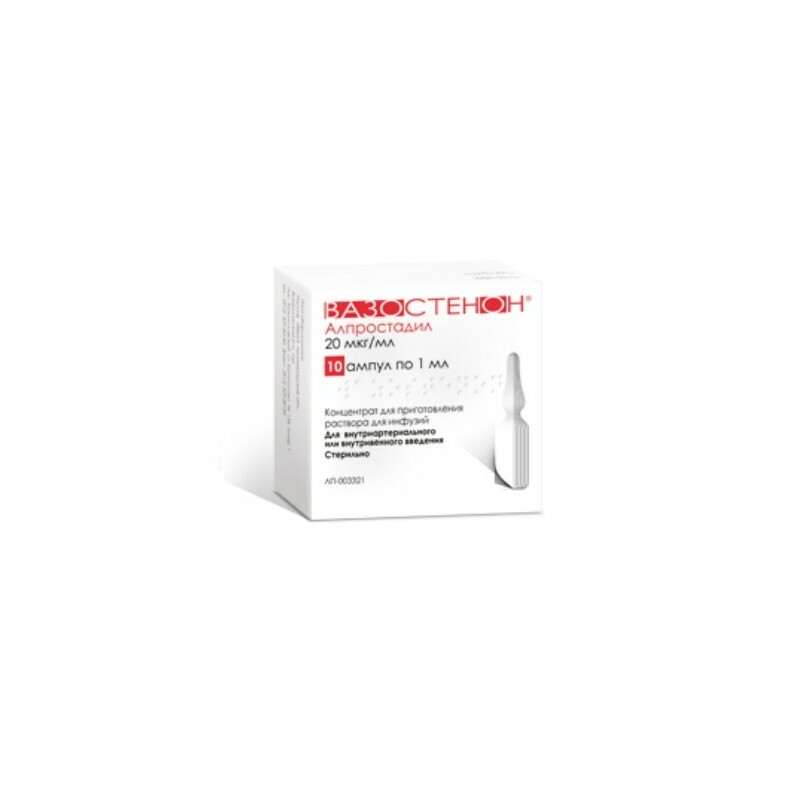 It increases blood flow by dilating the arterioles and the front of the sphincters. 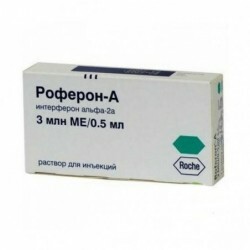 Alprostadil improves microcirculation and rheological properties of blood. After intravenous administration in healthy volunteers and patients, an increase in the elasticity of red blood cells and the suppression of their aggregation ex vivo is observed. Alprostadil effectively suppresses platelet activation in vitro. This effect also extends to the form, aggregation, secretion of substances contained in the granules, and to the release of thromboxane - a substance that promotes aggregation. The drug leads to a decrease in the formation of arterial blood clots. In humans, it causes stimulation of fibrinolysis and an increase in certain indicators of endogenous fibrinolysis (plasminogen, plasmin, activity of tissue plasminogen activator). Pharmacokinetics. After intravenous administration of alprostadil at a dose of 60 μg / 2 h, the maximum plasma concentration of healthy volunteers exceeded the maximum concentration in the placebo phase (2.4 pg / ml) by 6 pg / ml. The half-life of the alpha phase is approximately 0.2 minutes (calculated value), and during the beta phase approximately 8 minutes. Thus, the equilibrium concentration is reached soon after the start of the infusion. Alprostadil is metabolized in the lungs - about 80-90% during the first passage. The primary metabolites that form during the first passage are 15-keto-PGE 1, PGE 0 (13,14-dihydroPGE 1) and 15-keto-PGE 0 (13,14-dihydro-15-keto-PGE 1) - in turn, have further decay, in particular, by beta-oxidation and omega-oxidation. Metabolites are excreted in the urine (88%) and feces (12%). Full withdrawal is carried out in 72 hours. The primary metabolites of only 15-keto-PGE 0 can be detected in vitro using lung homogenates. After the use of alprostadil 60 μg / 2 h, healthy PGE 0 volunteers reach a maximum plasma concentration of 11.8 pg / ml after the placebo phase (1.7 pg / ml), while the half-life is approximately 2 minutes in the alpha phase and approximately 33 min during the beta phase. T max is reached after 119 minutes. The corresponding values ​​for 15-keto-PGE 0 are: C max 151 pg / ml (placebo 8 mcg / ml), t ½α for about 2 minutes, t ½ 20 minutes and T max for 106 minutes. Alprostadil is 93% bound to the macromolecular components of blood plasma. Vasostenon is intended for intraarterial or intravenous administration in the form of a solution. For the introduction of the drug is recommended to use an automatic syringe or infusion pump and a catheter for infusion therapy. 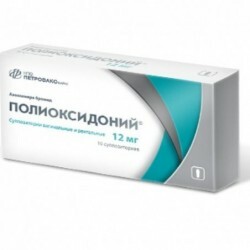 The dosing regimen presents daily doses calculated for patients with normal renal function, whose body weight is 70 kg. Patients with impaired renal function, if the level of creatinine in the blood exceeds the norm (in men> 97 mcmol / l, in women> 80 mcmol / l), at the beginning of therapy, daily doses should be reduced by half. Depending on the clinical condition of the patient, it is possible to increase the dose to this for patients with normal renal function within 2-3 days. intraarterial administration When intra-arterial injection the likelihood of adverse reactions is higher in the case of short-term infusion. Based on this, in order to ensure patient safety, it is recommended to start the infusion with small doses and, in the absence of adverse reactions, increase the dose. For the prevention of thromboembolic complications, administration of 15,000 units of heparin per day is recommended. Intra-arterial injection within 12:00. Daily dose - 5-30mkg, the recommended dosage of 0.1 - 0.6 ng / kg / min. When choosing a daily dose (5–30 mcg), Vasostenon should be diluted in 50 ml of 0.9% NaCl and given at 12:00 with an automatic syringe. Intra-arterial injection within 1-2 hours. 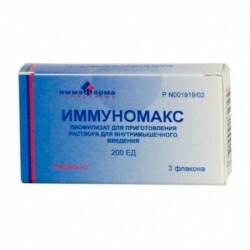 Daily dose - 10 - 20 mg, the recommended dosage at a dose of 10 mg - 1.2 ng / kg / min; at a dose of 20 mcg - 2.4 ng / kg / min. Intraarterial administration during surgery During reconstructive surgery, 5-40 μg of the drug diluted in 50 ml of 0.9% NaCl is administered intravenously. introduction The daily dose is 40 mcg of alprostadil 2 times a day or 60 mcg of alprostadil 1 time a day. The recommended dosage is 4.7 ng / kg / min. 40 mcg of alprostadil should be diluted in 50 - 250 ml of 0.9% NaCl solution and injected into a vein over 2:00 in the morning and evening. 60 μg of alprostadil should be diluted in 50 - 250 ml of 0.9% NaCl solution and injected into a vein within 3:00 once a day. Children. Do not apply to children. Treatment of chronic obliterating diseases of the peripheral arteries of stage III and IV in adults, if the procedure is not possible, has a vasodilator effect, or if such a procedure has not been successful. Introduction is not recommended for the treatment of chronic obliterating diseases of peripheral arteries of stage IV. 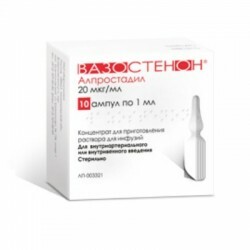 Active ingredient: alprostadil; 1 ampoule contains 20 micrograms of alprostadil; excipients: ethanol. Adverse events are classified by frequency as follows: very often (≥ 1/10), often (≥ 1/100, <1/10), infrequently (≥ 1/1000, <1/100), rarely (≥ 1/10000, <1/1000), very rarely (<1/10000), frequency unknown (cannot be estimated from the available data). On the part of the nervous system: often - headache, paresthesias of the limb on which the manipulation was carried out; infrequently - confusion; rarely - cerebral seizures frequency is unknown - stroke. On the part of the gastrointestinal tract: rarely - gastrointestinal diseases, including diarrhea, nausea, vomiting and acceleration of intestinal peristalsis. Since the cardiovascular system: infrequently - lowering blood pressure, tachycardia, angina rarely arrhythmias, heart failure with cases of acute pulmonary edema, which can lead to a common heart failure unknown frequency - myocardial infarction. On the part of the digestive system: rarely - a violation of the level of liver enzymes. On the part of the respiratory system, chest organs and mediastinum: rarely - pulmonary edema; unknown frequency - shortness of breath. On the part of the blood system and lymphatic system: rarely - leukopenia, leukocytosis, thrombocytopenia. Study: infrequently - an increase in liver function indicators (transaminases): an increase in temperature, changes in the CRP (C-reactive protein) index after the completion of treatment, these indicators quickly normalize. From the skin and subcutaneous tissue: often - redness, swelling, flushing. General disorders and reactions at the injection site: very often - pain, erythema or edema of the limb, into which the infusions were administered; often - a feeling of warming, a feeling of swelling, swelling at the injection site, paresthesia, with intravenous administration - redness of the veins at the injection site; after intra-arterial injection - a feeling of warming, a feeling of swelling, swelling at the injection site, paresthesia; infrequently - increased sweating, chills, fever, after the introduction - a feeling of warming, feeling of swelling, swelling at the injection site, paresthesia; unknown frequency - phlebitis at the injection site, thrombosis at the site of catheter insertion, local bleeding. On the part of the immune system: rarely - allergic reactions (skin hypersensitivity reactions, including rash, swelling, discomfort in the joints, febrile reaction, sweating, chills) very rarely - anaphylactic or anaphylactoid reactions. On the part of the musculoskeletal system and connective tissue: infrequently - articular symptoms, including pain very rarely - reversible hyperostosis of the long tubular bones after using the drug for more than 4 weeks. Reporting adverse reactions. Reporting on suspected adverse reactions after drug approval is important. This allows you to continue monitoring the balance of benefit / risk of the drug. Health professionals are asked to report any alleged adverse reactions through the national reporting system. Hypersensitivity to alprostadil or other components of the drug; impaired heart function: decompensated heart failure class III and IV according to the classification of the New York Heart Association (NYHA) heart failure due to previous treatment failure; arrhythmia of various etiologies, including arrhythmia, which causes hemodynamic disturbances; cardiac arrhythmia due to previous treatment failure; insufficiency and / or stenosis of the aortic and / or mitral valves; inadequately controlled coronary heart disease; coronary heart disease; recent myocardial infarction (within the last 6 months); suspected acute / chronic pulmonary edema, as a result of a clinical or radiological examination, a history of pulmonary edema or pulmonary infiltration; severe chronic obstructive pulmonary disease, thrombosis, lung disease; liver disease, including the presence of signs of acute liver failure (elevated transaminase or gamma-glutamyl transpeptidase) or severe liver failure (including history); renal dysfunction tendency to bleed (acute erosive or bleeding gastric and / or duodenal ulcer, polytrauma) stroke in the last 6 months severe hypotension; general contraindications to infusion therapy (for example, congestive heart failure, pulmonary or brain edema, and overhydration) During pregnancy and breastfeeding childhood. With drug treatment, the effect of antihypertensive drugs, vasodilators, and antianginal drugs may increase. 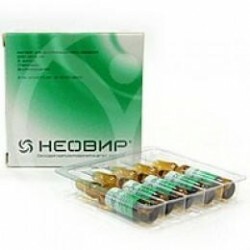 With the simultaneous use of these drugs with Alprostadil and the use of other vasodilators, careful monitoring of the cardiovascular system, including blood pressure monitoring, is necessary. Sympathomimetics, adrenaline, norepinephrine reduce vasodilator action of the drug. The simultaneous use of the drug and antithrombotic agents (anticoagulants, platelet aggregation inhibitors, thrombolytic agents) may increase the tendency to bleed. Given the weak inhibitory effect of alprostadil on platelet aggregation in vitro, should be used with caution in patients who are taking anticoagulants at the same time. 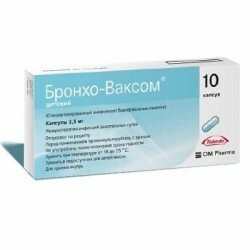 Simultaneous use with cefamandol, cefeperazone, cefatetan reduces the effect of the drug Vazostenon. Patients at risk of drug therapy should be carried out with caution, carefully watching the patient during the administration of each dose. Patients prone to heart failure in their age, and patients with coronary heart disease should be monitored in the hospital during treatment and for one day after discontinuation of therapy with the drug. With caution to prescribe the drug and arterial hypotension. To prevent overhydration, infusion volumes should not exceed 50-100 ml per day (administration using an infusion device). You should also follow the recommendations on the duration of the infusion (see Section "Dosage and administration"). Monitoring of patient's cardiovascular parameters (blood pressure and heart rate), body weight control, fluid balance, central venous pressure, and echocardiography are needed. The patient can be discharged from the hospital only in the case of establishing stable indicators of the cardiovascular system. The same careful supervision (control of fluid balance and indicators of renal function) is required for patients with peripheral edema or renal dysfunction (serum creatinine level> 1.5 mg / dL or glomerular filtration rate Be wary of prescribing to patients on hemodialysis (treatment should be carried out in a period of discomfort) for type 1 diabetes mellitus, especially in patients with severe vascular lesions. Vazostenon should be administered only by physicians with experience in the treatment of obliterating diseases of peripheral arteries, who are familiar with modern methods of continuous monitoring of cardiovascular system parameters and have appropriate equipment for this. Do not use alprostadil by jet (bolus) injection. In the case of simultaneous use with antihypertensive drugs, vasodilators and antianginal drugs should be carefully monitored indicators of the cardiovascular system (see. Section "Interaction with other drugs and other types of interactions"). Use during pregnancy or lactation. Do not use women of reproductive age and during pregnancy. If necessary, the use of the drug during lactation should be discontinued. Women of reproductive age should use effective contraceptives to prevent pregnancy during drug use. These preclinical studies of fertility do not indicate the effect of the drug on fertility when applying therapeutic doses of the drug. The ability to influence the reaction rate when driving vehicles or other mechanisms. Like all drugs acting on the cardiovascular system, the drug can adversely affect the ability to drive vehicles and other mechanisms, especially at the beginning of treatment, with increasing doses, discontinuing the drug, drinking alcohol, can lead to a decrease in systolic blood pressure. Patients should be informed of the need for caution when driving and working with machinery. Symptoms An overdose of the drug can lead to a decrease in blood pressure and reflex tachycardia due to the effect of vasodilation. Other possible symptoms: vasovagus syncope with pale skin, increased sweating, nausea, vomiting, myocardial ischemia, heart failure. Local reactions are possible: pain, swelling and redness of the limb, in which the infusion is carried out, manifestations of hypersensitivity. Symptomatic treatment. There is no specific antidote. In case of overdose (severe pain, lowering blood pressure), reduce the dose or immediately stop the infusion. With a decrease in blood pressure, first of all you need to put the patient on his back, lifting the lower limbs. If symptoms persist, check the parameters of the cardiovascular system. If necessary, you can use sympathomimetics.